CONI Cuger's Absolute Bullet Proof - Bullet is 17 months old in this picture and is still growing. He has ennoblements on both sire and dam's sides and is a 2Dox Cuger grandson. His kids have been amazing, some of the best I've gotten. His doe kids are feminine and the buck kids masculine and muscled! We are exited to have this top-notch buck in our herd. 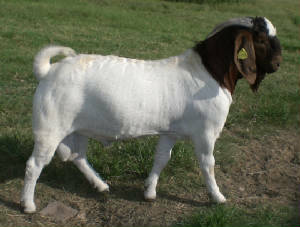 CONI Hot Pursuit - Boogieman (as we called him) was only 14 months old when this picture was taken, has the length, width, beautiful rear and smoothness we wanted in a buck and those traits are being passed along to outstanding show wethers and show does. His kids are every thing we hoped for in his offspring! Big and broad, with their dad's length and great "booty". Boogie was sold back to Ross Ranch to continue producing great kids and to give us the opportunity to get our new buck, but sadly Boogie passed away a few months later. Because of that, I am keeping almost all of his doe kids from last year. CONI Vindicator's SHIELD (ABGA #10653406) (from the big red shield on his chest). Nicknamed Patch, he has produced some amazing kids...thick and wide...and he just turned two years old when this photo was taken. His show wethers have done great in the show ring. His daughters are absolutely beautiful. Patch is long, extremely wide in the loin and chest and has an awesome rear end. He was sold back to Ross Ranch, since his sire Vindicator and grandsire Warrior "Ennobled" have both pass away, to keep those great genetics going. We have kept many of his daughters to continue to improve our herd. CONI Big Boss Man (ABGA #10579355) Boss Man is just an absolutely beautiful buck. He is long and wide, tall and broad. 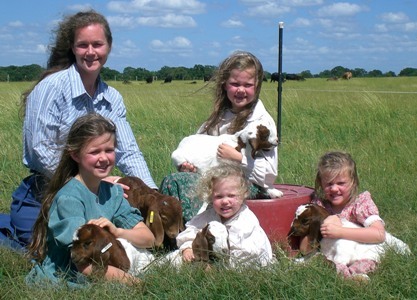 He produces gorgeous, correct doe kids and great wethers. We have kept many of his outstanding daughters to add to our herd. He looks like a million and produces the same way! Boss Man has been sold and is now working in Montgomery. CONI Hodge Warrior (ABGA #10447066) This boy has it all. "Short Stack", as we call him, is thick and wide, very long and puts that on his kids. 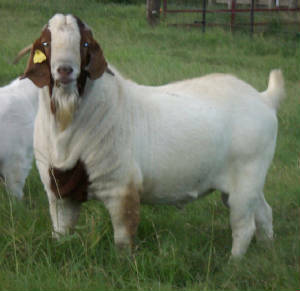 We've gotten some of our best show wethers and show does out of this boy. Very laid back in temperment and easy going. We are sad to say that Short Stack passed away recently. He will be missed greatly. CONI Big & Bad (ABGA #10487486) An absolutely beautiful buck and only 15 months old when this picture was taken, BB is exceptionally long and wide and he is passing that on to kids that are outstanding. 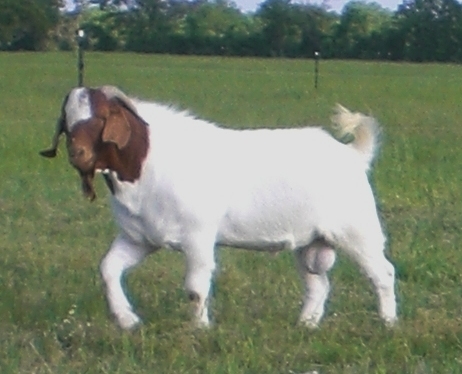 BB won in the show ring as have his kids. We have kept his daughters and BB has been sold back to Ross Ranch, since his sire Anvil passed away, to keep those outstanding genetics going there. 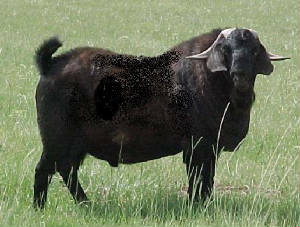 Texas Black Angus (USBGA #044190220) an outstanding solid black, 100% Boer buck was one of the earliest black bucks registered. Angus threw solid black, black & white, solid red, paints and traditional colored kids. He was sold to the Felands of Sealy. He died of old age, but the Felands still use his sons and grandsons in their breeding program. Blanco's Instant Replay (USBGA #060810847) "Noly's" kids are long, tall and extremely well-muscled. 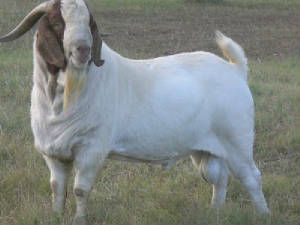 His pedigree includes Nico Botha Highlands104 "Ennobled", Ram H Tobias "Ennobled", DSM Wobbles "Ennobled", Mojo Majic "Ennobled", MZuri Gold, CONI M33 & CONI MACE. We kept his daughters and sold Noly to the Lange Family of Tabor. Our does' pedigrees include Downen Big 85 "Ennobled", Kaptein "Ennobled", Eggsorcist "Ennobled", Mojo Majic "Ennobled", Dow Pipeline "Ennobled", Lobola S.A. "Ennobled", Johaan "Ennobled", ORF 1147 "Ennobled", NBBG Tsjaka "Ennobled", Mzuri-Gold, Mufasa SA, Eggsemplary, HMR Soro, Comanche's Sean Connery, and Texas Ranger. They produce kids that have length and muscle.